There are a lot of anime out there about falling in love, but rare are the series that are willing to spend 12 full episodes doing nothing but exploring the growth of two people's friendship. And still rarer are those that do it even half as well as One Week Friends. High school girl Fujimiya is plagued by a problem. Each Monday, she loses any and all memories relating to her friends. Thus, she isolates herself as much as possible. By having zero friends, she loses no memories, after all. 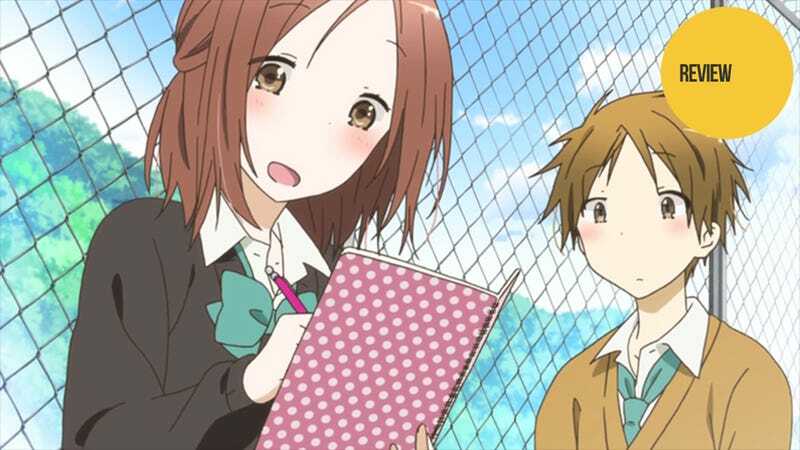 But one day, a boy in her class, Yuki, decides to be her friend despite her protestations. But when she loses all memories of him the next week, he resolves to start over and befriend her again and again each week, hoping that one day she'll be able to remember him. A lot of One Week Friends is spent exploring Fujimiya's problem—not only the cause of her strange malady but also the extent to what memories she loses. Does she forget just the person or the events surrounding that person? Does she have holes in her memory or does she not realize what she lost? What about acquaintances, friends of friends, or family? Do they get reset as well? And what is it like for Fujimiya? Is she happier losing these memories than she was being isolated? All these questions are answered over the course of the series. The story also goes a long way into looking at how they try to combat the situation by using diaries and posters—and also show what happens when such crutches disappear suddenly. Moreover, we see how all of Yuki's efforts affect Fujimiya as her condition subtly changes over the course of the series. Good – What Is Friendship? Fujimiya's fictional disease is excellently defined which, in turn, allows it to be a perfect tool for exploring the nature of friendship. In fact, the series is structured in such a way that each episode is centered around an aspect of friendship. This can be anything from how to interact with friends of friends or parents of friends, to dealing with your first fight as friends and the resulting aftermath. All in all, the friendship-related themes that set up each episode are just as interesting as the ongoing plot and really make you think about what it means to be a friend. Yuki is easily the most interesting and real-seeming character in the story. It is clear from the start that there is a struggle inside him: one of selflessness versus selfishness. On the selfless side, he sees Fujimiya completely isolated and alone—never happy, just plodding through life. He wants to help her begin to truly live life again and thus resolves to be her friend. But on the selfish side of things, he wants more. He clearly has feelings for her and wants her to reciprocate them. However, he knows that in her current situation, a normal relationship is impossible. Yet, even as he tries to help her get past her memory problem, he is continually faced with the fact that every time he helps her gain a new friend, he becomes less important—further from the dream goal of being romantically involved with her. But in the end, to his credit, he always chooses the selfless path, despite the pain it causes him—a path that leads him directly towards the series' final climax. At the start of One Week Friends, Yuki, in an almost hilariously formal way, asks Fujimiya to be his friend. His profoundly heartfelt wish and unwillingness to give up breaks through her shell and allows her to open up again. But by the end of the series, Yuki has discovered the cause of Fujimiya's memory problem and realizes that by being so close to her, he is inadvertently in a position where he can hurt her just as badly as she was in the past. To avoid this danger, he, as always, decides to forsake his own feelings and go for the safer path: to distance their friendship. He believes if they are just “normal friends” instead of “close friends” he will no longer be in a position to hurt her. Of course, she realizes something is wrong and, after asking around, discovers the reason. And like him, she tries to keep their relationship at a distance, but can't, eventually breaking down in tears as she admits that she wants their friendship to continue to deepen. Thus the story goes full circle—with her heartfelt wish getting through to Yuki and breaking through his shell of fear. And then, to cap it off, the series ends as it began—but with a twist: Now at the start of each week the two of them politely bow in unison and ask to be each other’s friend. Even as their story seems far from over, the ending makes it all feel complete. One Week Friends is a beautiful, heartfelt look at friendship. It has great characters and uses its unusual setup to its fullest. If a lighthearted anime like this sounds even remotely interesting to you, drop everything and give it a watch. You'll be glad you did. One Week Friends aired on Tokyo MX in Japan. It can be viewed for free with English subtitles in the US at Chrunchyroll and Hulu. For more of the season's best anime, check out our guide on the five anime of spring 2014 you should be watching.